Flowers are naturally appealing and always a welcome birthday gift. They brighten the day, add a smile and revive the senses. Flower birthday cards give pleasure too and are delightful to receive. So, what flowers would you choose? Will your flower choices have a special meaning or represent something unique to your recipient? Knowing a person's birth flower can inspire your card ideas as different flowers represent different months . Each flower has it's own meaning and symbolism. 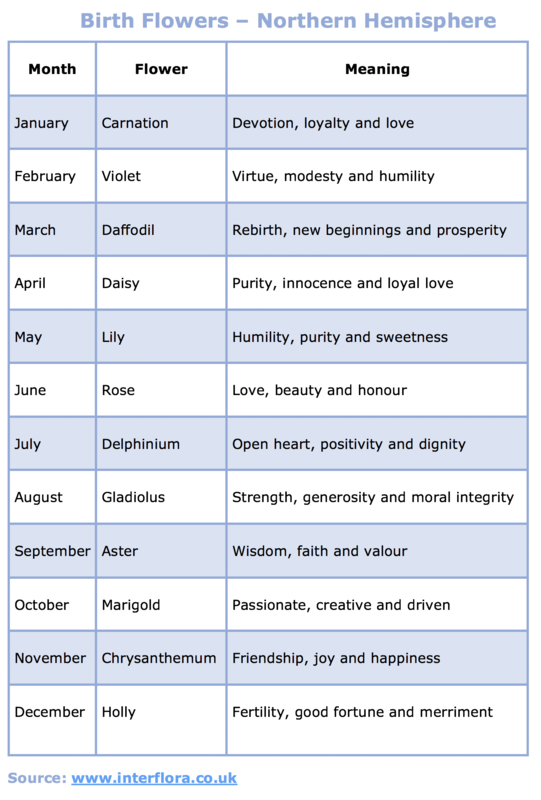 (Flowers and meanings will vary depending on wherever you live in the world). 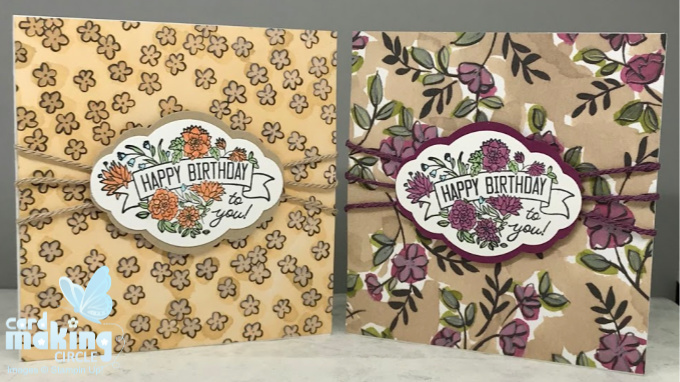 These two 4" square cards were created with patterned paper. Twist matching twine around the piece of 4" square patterned paper three times crossing over on each turn. Stick the ends of the twine on the back with tape. Spread out in a fan pattern. Stamp sentiment onto white card and colour using your preferred colouring medium. 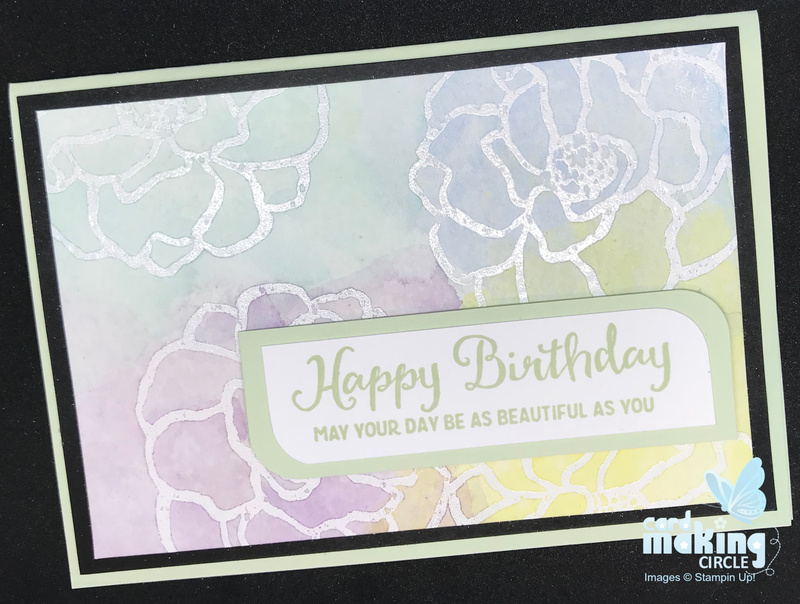 Punch out sentiment with the Pretty Label punch from Stampin Up!. Punch a second shape in matching card. Cut in half and stick on the back of the sentiment card to create a shadow. Mount completed sentiment card onto the front of the patterned paper with foam pad. Stick the patterned paper onto a 4" x 4" card base. To achieve this you need to cut a 4" x 8" piece of card. This card has an old fashioned delicate look that is easy to replicate. Stamp the flowers onto white card with a grey ink and colour. Trim sides to a rectangle shape either with a trimmer or rectangle die. Cut a layer of matching patterned paper. Mount the flower rectangle onto the patterned paper. Mount both onto a card base. Finally stamp a small "Happy birthday" in the bottom left hand corner of the card. 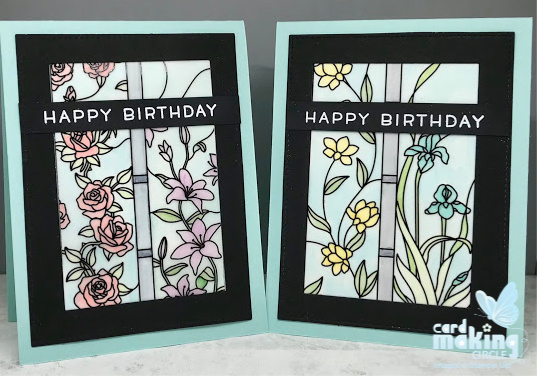 Both of these cards were made using the Graceful Glass designer vellum from Stampin Up! Each sheet is has a pre printed design ready for colouring. Colour on the reverse of the card. I used alcohol markers but you can use whatever colouring medium you prefer. Mount the vellum on white card to create a translucent effect. Use tiny amounts of glue on the grey areas to avoid the glue showing through the front of the paper. Cut a window from black card with either rectangle dies or a craft knife and a cutting board. Stick the mounted Vellum onto the back of the black layer so it "shines" through the window. Mount onto a prepared matching card base. Add a sentiment strip across the card front to complete the card. For this card start with the card base. Stamp tone on tone stamping on the front for the card background. Place to one side. 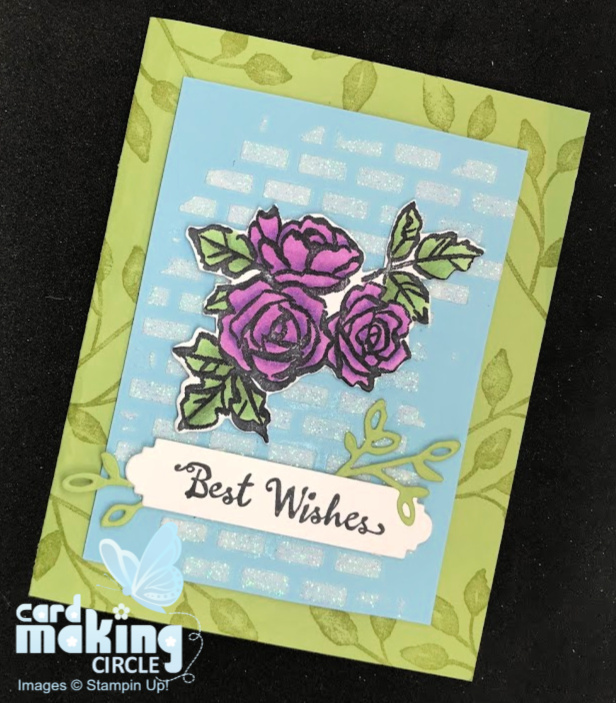 Add texture to the card layer with embossing paste. Lay a brick mask or stencil over the top of the card layer securing with painters tape. Scoop out embossing paste with a palette knife and smear over the stencil. Lift the stencil off straight away as the embossing paste drys quickly. Leave card layer to set. Wash stencil and palette knife with soapy water. Stamp a flower image and colour. Die cut or fussy cut image. Add to the front of the embossed card with foam pads. Create a sentiment and add with foam pads and embellishments. Finally stick your embossed card layer to the front of the card base to complete the card. 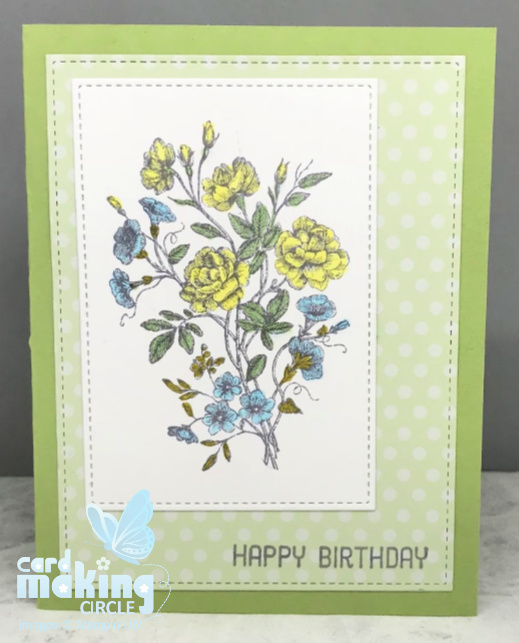 The final flower birthday card uses watercolour paper and watercolour paints. Stamp the flower image onto the watercolour paper with Versamark ink and heat emboss with white embossing powder. When cool tape the watercolour paper to a mat or card with painters tape to keep it flat when painting. Use a brush to wet the watercolour with water - this creates a wash known as the wet-on-wet technique. Add wet paint on the top of the wet wash. The colours will naturally blend. Leave to dry. When dry trim to size and layer with contrasting colours onto a card base. Complete with a sentiment and add to the card front with foam pads.